There is no need to spend tons of money on going to the dentist to whiten your teeth. Just do it at home with baking soda and peroxide. I have been doing this for a week now and can see a difference. I just wish I would have taken a before and after pic. Did you know that those whitening trays and toothpastes at the store are mainly made up of baking soda and peroxide? I personally do not want to spend $3-$5 on toothpaste or even $20+ on kits to whiten my teeth when I can get a box of baking soda for 50 cents and peroxide for a buck. So here is the recipe!! 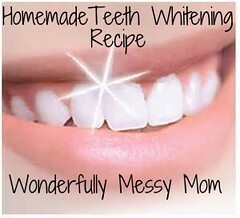 ~Make a paste out of this and put on toothbrush, then add small amount of your regular toothpaste. Brush with this daily if you have healthy teeth or 2-3 times a week. You will start to see results in about a week. Enjoy this cheap recipe that really works!! !